This unusual look at the natural world explains how to create fanciful animals from leaves. 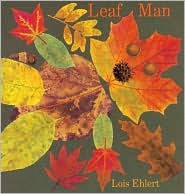 "When Leaf Man disappears in the wind one day, readers follow his trail 'past the chickens, toward the marsh, over the ducks and geese,' which are all amazingly configured from leaf collages too." "One cool day Mouse and Minka venture out to play. 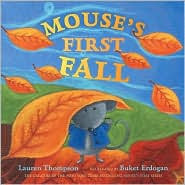 From leaves of all colors -- red, yellow, orange, and brown -- to leaves of all shapes and sizes -- from pointy to round -- Mouse learns that fall is a season full of fun!" "Ruby is trying to collect different types of leaves but all her little brother, Max, wants to do is jump in them." "As summer ends, Fletcher, a young fox, begins to worry that his favorite tree is sick. Leaves turn brown and fall. Fletcher tries to catch and reattach them but is distressed as he is unable to save any. He takes the last leaf to bed with him, sad that his tree is left all on its own. The next morning, however, he discovers the tree covered with shining icicles, 'more beautiful than ever' ." "It's a young bear's first autumn, and the falling leaves surprise and thrill him. At first he tries to put the leaves back on, but by spring he's learned about the tree's wondrous cycle." Cut out a simple tree trunk and tree limbs on the brown paper. Have your child glue it towards the bottom, middle of their blank paper. Squirt some red and yellow paint on the paper plate and then have your child mix a little of each together to make orange. Have your child dip their thumb into the paint and then press it onto their paper to make different colored “leaves” all over their tree. My two year old had more fun swirling around the paint on her paper plate than actually making her picture. That is okay too. Remember it is about them exploring with their senses and being creative. Collect a variety of fall leaves of different shapes, color, and sizes (This activity works better if you press the leaves flat with a heavy book for a day or two before doing this activity). If you don't live in a place that has all four seasons than cut out leaves from paper in various shapes and sizes and colors. 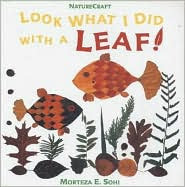 Read and look through the books: "Leaf Man" or "Look what I did with a leaf" and try out some of the leaf animals featured in the book, or come up with your own. Gather a variety of fall leaves. place them between two pieces of wax paper, making sure that you leave plenty of space between them so they don't touch each other. Iron over wax paper to fuse the two pieces together. Using scissors, cut a spiral pattern in a piece of construction paper, starting from the outside edge and going in towards the middle. Grab the center of the swirl and punch a hole in the end (this will be the top of the mobile). 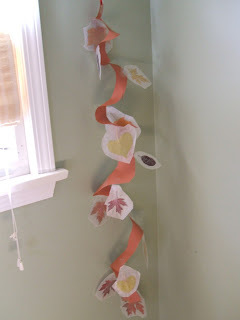 Tape your wax paper covered leaves on various spots of your spiraling paper. Tie a string through the hole at the top and hang your mobile. Gather various leaves or cut them out of paper, and sort them into categories. Have fun raking leaves into a pile and jumping in them. I love your ideas. Thank you, thank you, thank you! Loving all of the ideas, too Amy. I especially like the leaf animals. Wow Amy! 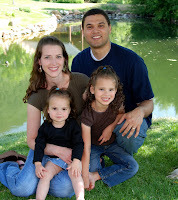 I stumbled onto your blog through meilani's blog. I am kahi's sister Lilia. Your ideas are amazing and look like so much fun. Thank you! I was just thinking I had to tell Kahi but I can see she already knows. I will keep checking this out and start doing some with my kiddies.